At an event in New Delhi, HMD Global, the Home of Nokia phones unveiled the budget Nokia 3.1 Plus smartphone. Unlike the Nokia 5.1 Plus and Nokia 6.1 Plus smartphones, the Nokia 3.1 Plus is a smartphone aimed at offline audience. Wth the Nokia 3.1 Plus, the Finnish upstart company is looking to crack the offline market which is heavily competitive right now with phones such as the Xiaomi Redmi 6 and Vivo Y81. The 3.1 Plus has the Helio P22 chipset underneath which also powers the Redmi 6 and Nokia 5.1. The newly launched device comes in two storage configurations- one with 2GB of RAM with 16GB of storage and the other one with 3GB of RAM and 32GB of internal storage. Moving onto the detailed specifications of the Nokia 3.1 Plus, it offers a 6-inch HD+ display on the front with 18:9 aspect ratio and 2.5D curved glass on top. The smartphone works with the help of MediaTek Helio P22, which is paired with 2GB/3GB of RAM and 16GB/32GB of internal storage. There’s a dedicated microSD card as well for storage expansion up to 400GB. The Nokia 3.1 Plus is also an Android One smartphone and it comes with Android 8.1 Oreo out of the box. Notably, it’s the second Android One smartphone after the Nokia 3.1 and Nokia 5.1 to be priced under Rs 15,000, and we all know about HMD’s track record of rolling out regular software updates. The phone offers connectivity options such as 4G LTE, VoLTE, Wi-Fi 802.11 b/g/n, Bluetooth, GPS and Micro USB port. The phone boasts of the plastic body and weighs 180 grams which is largely due to the 3500mAh battery inside. 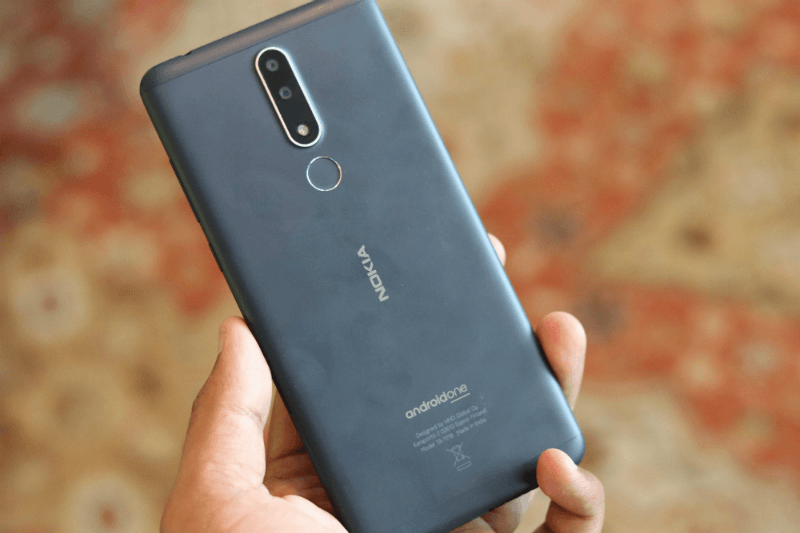 Thanks to the affordable price tag, the Nokia 3.1 Plus lacks fast charging support too. On the brighter side, the phone comes with dual rear cameras of 13MP+5MP, with the secondary sensor capturing depth information. Frontal, HMD Global has added an 8MP shooter with screen flash option. Sensors on the handset include ambient light, proximity sensor, accelerometer, e-compass, gyroscope and the fingerprint sensor is placed on the rear side. The Nokia 3.1 Plus comes in three colour options- Blue, White and Baltic (which looks like Silver). Aforesaid, HMD has introduced the device in two variants- 2GB+16GB and 3GB+32GB variant priced at Rs 11,499. As for the availability, the phone will be available across various retail stores and Nokia Online Store. Going by the asking price and hardware of the 3.1 Plus, the primary competitor is the Xiaomi Redmi 6. The Redmi 6 also packs dual rear cameras and has the Helio P22 chipset underneath. It also comes in two variants with 3GB+32GB of storage and 3GB+64GB of storage, priced at Rs 8,499 and Rs 9,999 (offline market) respectively. The Redmi 6, however, runs MIUI 9.6 based on Android 8.1 Oreo while the Nokia 3.1 Plus comes with stock Android with a promise of monthly security updates. The Redmi 6 also loses out on the battery front because it has a smaller 3000mAh unit as opposed to the 3500mAh unit we get on the Nokia 3.1 Plus. Another competitor to the Nokia 3.1 Plus is the Realme 2, but it’s an online only smartphone. It offers a notched 6.2-inch HD display, coupled with Snapdragon 450 SoC and 3GB+32GB of internal storage. The Realme 2 also boasts of dual rear cameras and comes with a beefy 4230mAh battery. Why the Realme C1 Surpasses Redmi 5A as the Perfect Budget Friendly Smartphone? Could have kept 7k-9k range.